The extended tip Jointer was used on all the Ford-Ferguson and Dearborn Plows, according to the MPC's and what Scott says. I have only seen them on the early Ferguson-Sherman plows, and only on 1-bottom plows. 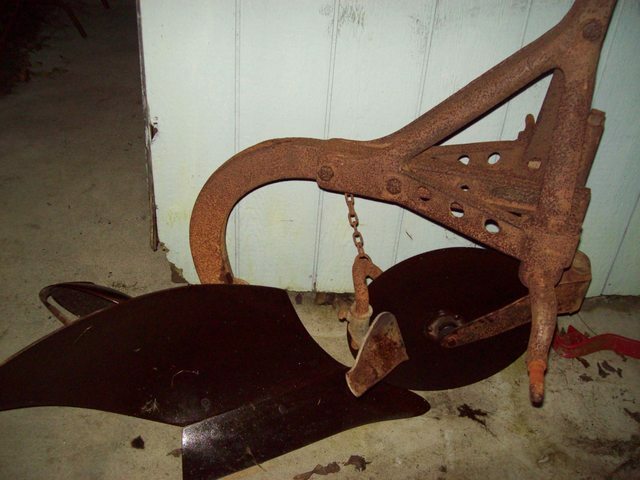 I have my grandfathers' original 1-bottom F-S plow, with the FORD script cast into the mainbeam and it is complete with the original coulter and extended arm jointer. I recently saw this F-S 1-bottom plow, complete, and it has the extended jointer as well. I believe the intent was to help assist better rollover of the furrow slice. the jointers' design was actually a kind of mini-moldboard. Coulters and Jointers were always optional equipment on the plows as well. You didn't need them to plow with, but you do need the rolling landside (Tail Wheel) or furrow wheel.